First of all, it's important to know that I don't always stick with the same routine. I use a very instinctive approach, varying my workouts frequently. In spite of this, there is a general format I follow for my chest training, and approximately every six weeks it changes. I train chest twice a week, usually with shoulders. Normally, my initial exercise is a pressing movement, most likely the barbell bench press. For this exercise I'm not concentrating on doing a power movement or lifting a heavy weight but rather on working the chest muscles as thoroughly as possible, getting a full extension and contraction, keeping my elbows out from my sides and bringing the bar down to a point high on my chest -- to about the top of my tank top. For the bench press I use a medium grip because I find that if it's too narrow, I use too much triceps, and if it's too wide I lose the full length of movement to properly work the chest; therefore, I use a grip where at the bottom position my elbows are approximately 90 degrees. At the bottom of the bench press movement I make sure I feel a stretch, maintaining tension all the way without letting the bar sink into my chest -- it barely touches. Then I explode it upward to a full lockout at the top. It's down slow and up fast, although, of course, the heavier the weight, the more I think about exploding from the bottom position. At the most I do five or six sets of bench, including a warmup set. When I was lifting very heavy, I used to do five warmup sets. Now, even a high-rep warmup set can be a workout set if you do it hard enough, which is why I count it. For all other exercises, however, I only do about four sets each. Three or four exercises are all I do for chest. Repetitions will be as low as six for the flat barbell benches, but for all other exercises I stay between eight and 12. On benches I pyramid the weight and decrease reps. On all other exercises I usually increase the weight only once throughout the set. For example, I might do one set with a moderately heavy weight, then go up for the next set and keep it there for the remaining sets. However, I don't like to go below eight reps. If I can only do eight reps on one set, I drop the weight so I do at least eight on the next set. Conversely, if I can do 12 reps on a set, I add weight for the next set to bring down the reps. Occasionally, I'll begin my workout with dumbbell bench presses. For this movement I again keep my elbows out wide to the sides, the dumbbells linear, not parallel, and with my palms facing forward. I do not turn my hands as I perform the movement; it's as though I'm holding a bar -- I feel this helps me get more of a stretch at the bottom. The only reason I might choose dumbbells over the barbell would be to get that stretch. My second exercise is always an incline movement, usually a press. Normally, I choose to use dumbbells, especially if I just did a barbell movement, because I like to maintain that variety. I use a low incline, since I feel the high incline brings in too much of the anterior deltoid. As a powerlifter I was a deltoid presser, so I find it too easy to bring my delts into it. Now I try to keep them out of the movement as much as possible. As in the flat bench press, I keep my elbows pointed out during the incline. Dropping your elbows in close to your body brings your deltoids into the exercise more, even on inclines. Next, I do an exercise that is not a pressing movement, usually pec deck or flyes, normally flat but sometimes inclined and occasionally even declined. These I do almost straight-armed. I don't believe in bent-arm flyes. That takes away the value of doing flyes at all; you may as well do another press. To me, the value of the flye is the stretch you get at the bottom position and the tension you get on the outer pec as you start the movement upward from the bottom, as well as the squeeze at the top. Because the flye is such a long movement, pulling out of the pecs, I don't use heavy weight because in the bottom position you're very vulnerable to injury. You have no long bar across the chest as you are pulling the pecs apart, so you have to be very careful in avoiding a tear. At the bottom of the flye I try to stretch the dumbbells down below horizontal as much as I can and still be comfortable. It should not be a position of discomfort, but you should feel a definite stretch. I resist the temptation to bend my arms; they are stretched out wide. At full extension the dumbbell is in the lowest point, not my elbow. I also keep my arm at the same angle -- almost 180 degrees -- throughout the entire movement, even at the top where, by the way, I do not lock out to get that extra crimp. That I save for the pec deck, which I feel hits the inner pecs better when done properly. From the bottom position of the flye, I try to move the dumbbells upward quickly but somewhat carefully until about halfway up, when the moment of force is not so great and the exercise becomes easier; then I slow up so they don't crash together. But the whole point of attempting to move the dumbbells upward as quickly as possible it so stretch the muscles even more, even though the movement itself might not be so fast. On the pec deck I concentrate on bringing my elbows rather than my forearms together. I feel this gets the inner pec much better than a flye movement. I do not grip the top of the pad with my hands; instead I try to push with my elbows. I also keep my elbows high, at about the center of my pecs. For any flye or pec deck movement I like to imagine a line from my sternum straight out in front of me a the plane through which my arms move, rather than have the movement begin from my shoulders. In other words, as I contract, I try to imagine my arms and pecs as one muscle or lever, with the power coming from my sternum rather than from my shoulders. I pull out and in front of my body, not into my chest. Cables are also one of my favorites. I bend slightly forward and lean into the cables with my arms slightly less than perpendicular to my body so I am working the middle to lower section of my pecs. Cable work I do in three different formats: top together, top-across-to-bottom, and bottom-across-to top. I do them one arm at a time, which enables me to concentrate more on the specific pec being contracted. Another exercise I do quite often is dips. At my gym we have a dipping machine with selectorized weights, which makes it much easier. On regular dipping bars I lean forward into them, with the apex of the bars in front of me. I arch my shoulders forward. Your shoulders should never move up and down; only your elbows should bend, and all the power should come from your chest. Think chest at all times, not triceps, shoulders or back. My grip is slightly out from my body, not so close as to work my triceps and not so wide as to work my shoulders. I do not use weight for dips. I find that dangerous and awkward. Instead, I do burnouts -- as many reps as possible for each set. Often I will superset dips with incline dumbbell presses or, occasionally, incline flyes. Rest periods between sets of any exercise are contingent upon whether I'm on- or off-season and upon how I feel I've recovered from the previous set. When I'm trying to build mass I rest until I feel I've fully recovered from the previous set, which can be anywhere from 30 seconds to 2.5 minutes. When I'm preparing for a contest, the rest period is always very short -- no longer than a minute at the most, most likely 30 seconds. But I don't sit there with a stopwatch. Remember, I do everything by feel. When I'm doing a movement, I like to think in terms of very direct aggression against failure. I don't like doing repetitions to failure because I hate the failed rep. Instead, I will struggle like crazy to do the last rep I can possibly do on my own, which on the bench press might take five seconds or so, then stop, rather than take two seconds to do my last rep and then have someone help me with a few more. When I have had someone help me do a rep, I haven't felt as if it did that much good. In other words, it wasn't me who did it. I may have done a "bit of a rep," but how do you do a "bit"? I also keep a very detailed record of everything I do. I've kept a training record since 1977 of every rep I've done, including every shock session, every lap I've run. My husband Steve trains with me, and he's the only satisfactory training partner I've ever had. I hate to sound like so many bodybuilders who say, "I keep burning them out," but that's exactly what happened. Even when I was powerlifting, I had to tendency to train too fast. But I like to get into a rhythm and keep going. Some of this has to do with the fact that I train so instinctively. Most training partners like to know before the start what we're going to be doing, but once I get into it, if something doesn't feel right that day, I might want to change, and that doesn't go down well with most training partners. Steve, however, knows me so well and understands, so he is fully tolerant of such things. Plus, he's a big guy who just trains for strength, not competition. And he's much stronger than me, so it's nice to have someone around in whom I have absolute confidence. On-season I keep my sets and reps the same, occasionally going from eight to 12 reps as high as 15, but primarily all I do is decrease rest periods and add more supersets. Also, rather than increase sets or reps, I might add another exercise so that instead of doing three or four movement, I'll do four or five. I might also want to add the Nautilus press machine and the Icarian flye machine, which I have in my gym. Sometimes I might do decline dumbbell presses or decline flyes, but I don't do decline barbell presses because they hurt my shoulders. Instinctive training for the chest may seem like chaos for some people, but for me it's just the opposite. It's using your head. It's scientific. And I am working all the muscles in the pectoral region thoroughly and from all angles. And I'm doing it safely, even though I train very heavy. A decade of covering the gamut from powerlifting to bodybuilding brought me to this point, and I'm not about to argue with empirical proof. In 1945 bodybuilding was still in its infancy. The Mr. America title was but six years old, and had been won by such distinguished nonentities as Roland Essmaker, Frank Light and Jules Bacon. But, in Las Vegas, Nevada, events were taking place that would change the physique world forever. Those events were the coming together of two Army physical fitness instructors, their mutual training interests decided to make up some equipment and train together as a lark, and enter the forthcoming Mr. America contest for experience. Those two instructors were Clarence Ross and Leo Stern. The equipment they fashioned included the then-revolutionary incline bench, lat pulleys and various other advanced apparatus that was just being developed on the West Coast at the time. For several months they diligently worked away, then traveled down to Hollywood for the contest. The results of course, are history. Clarence took the title, Most Muscular, Best Chest and Best Back, plus placing 2nd in the Best Legs subdivision. His win was the triggering of the modern era of training, the portent of things to come. With Clarence's winning in 1945, the next few years title winners reads like bodybuilding's hall of fame: 1946, Al Stephan; 1947, Steve Reeves; 1948, George Eiferman; 1949, Jack Delinger. And all during this time of the development of the modern physique, Clarence retained his preeminence in the field. He next took the Professional Mr. America title, and followed this with a win in the first Mr. USA contest, defeating Reeves, Stephan, Page and Pedersen for the title. Over the years since, Clarence has retained his top position, in 1955 taking his height class in the Mr. Universe contest and losing only by a whisker to Leo Robert. Ross, coming from sunny California, wasn't in a good position to cope with the then damp, rainy climate of England and immediately upon his arrival developed a serious attack of the flu before the show, losing over 10 lbs of muscle, and so was not at his best. In 1956 he reentered the Mr. USA contest "for kicks" and came a close second to Bill Pearl, and then retired from competition. Bill Pearl went on to develop into one of the greatest bodybuilders of all time. Also in the early 1950s Clarence took the Mr. North America title as well. It seems that Ed has always idolized Clarence as number one in bodybuilding, and so went out of his way to meet and spend some time with him whenever circumstances permitted. One day as they were finishing an impressive lunch in a leading West Coast restaurant, Clarence, then in this 30s, calmly took out a pack of cigarettes and asked Ed if he minded if he smoked. Ed, taken aback a bit, said, "Clarence, I never knew you smoked." "Yes," he replied, "I like a cigarette now and then, but I never smoke when I know there are young teenage fellows around . . . it would be bad for their growth potential and for bodybuilding's image." A man that would put the image of bodybuilding above his own personal pleasures is rare indeed, and there are too few of them around. And, this is a perfect example of why Clarence Ross is the respected man he is. No better representative of bodybuilding could be found. In addition to the universal respect accorded him, Clarence Ross was one of the true pioneers of weight training, one of the first to own 19-inch arms and a 50-inch chest, one of the first to show what really massive yet defined development could be obtained from weight training. In his training, Clarence had dome very definite preferences, and he was what might be termed a "pec pioneer." In rowing, use as much weight as possible. Don't be afraid to cheat so you can use more weight. Perform all your upper back exercises at one point in your program. It is best to practice several varieties for one month and then change to several others. For general gains . . . higher repetitions when seeking definition, lower repetitions when training for bulk. Lower reps, 6 or so, and higher sets, 5 or 6, build bulk fast. Bentover rowing is best when the weight is actually bounced off the floor, and there is considerable extra body motion. This is best done pulling the weight to the chest. Done in this manner, the exercise gives the maximum in power and bulk. The one arm rowing exercise is made more advanced if very heavy weights are used and the bell is bounced off the floor. As you reach the final stage of the movement, pull the shoulder up and away from the weight with a side motion of the body, and try to give an extra burst of power to raise the weight really high. This exercise will bring great power and muscular density. In a power rowing exercise, the weight is loaded while raised on two boxes . . . it is then pulled up and bounced off the boxes each repetition. 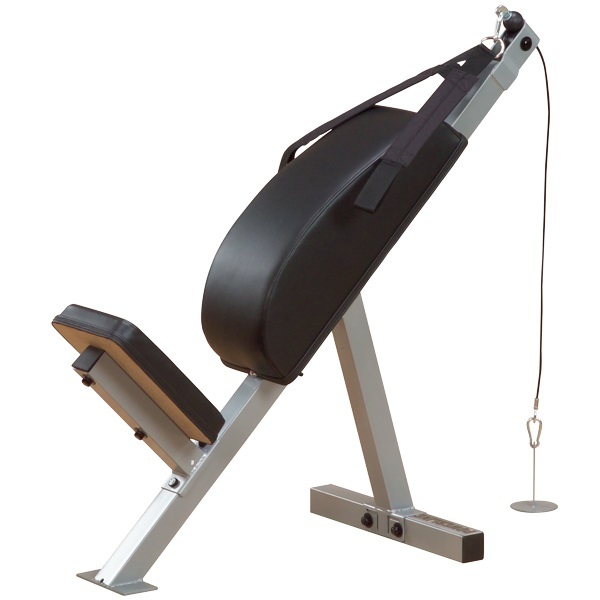 The short range action gives tremendous power and thickness to the lats. 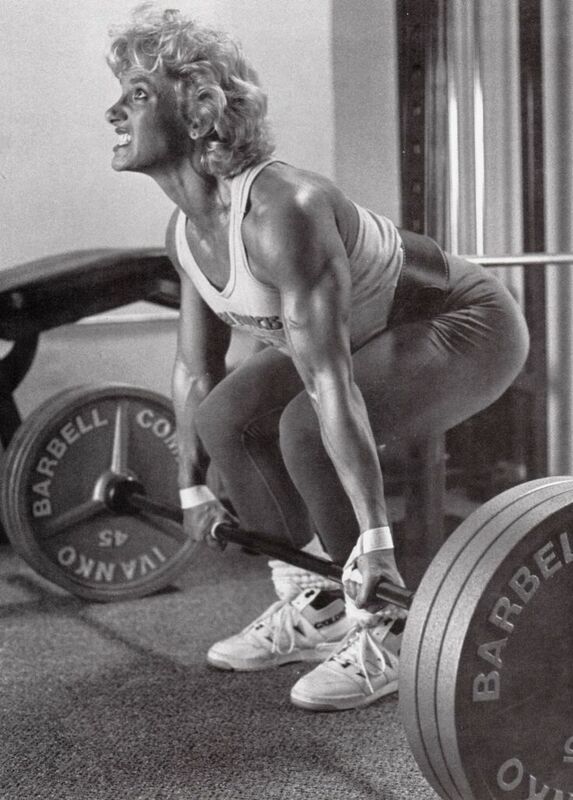 At the time much of the above was written, in 1953, concepts such as cheating exercise motion, forced reps and any amount of sets over three, flushing and the like were quite revolutionary. Though today just about every bodybuilder uses most all of the above in his workouts, at the time Clarence was instrumental in popularizing them he was sometimes greeted with hoots of derision by the "old school." But, how could you argue with a body like Clarence's? What can you say about a back as wide, thick and powerful as his, or about those "table top" pecs? The modern trend in bodybuilding is for bigger, more perfectly formed chests. Yet, in my opinion, many bodybuilders who are fully aware of this train their chest incorrectly, ending up with both a measurement size and a muscular appearance which is far from ideal. The most common error is in thinking of the chest as being solely a muscular unit. Bodybuilders specialize in bench presses, dips and flyes, pumping up their pecs with set after set of these exercises. However, for maximum chest building there is another type of growth which must be considered - structural alteration. By this I mean, if the proper exercises are performed it is possible for anyone to alter their rib cage to make it wider and deeper. It is here that most bodybuilders fail. In their eagerness to bulk up the pectorals and make them full and thick, they neglect rib box growth and hold back their chest development progress. The effect to strive for is a full stretching of the rib box. Do not use weights that are too heavy when doing this, for if you do you will be more concerned with handling the weight than obtaining the stretching effect. Deep breathing is important here. Take full, deep breaths between each repetition of each exercise. How tall do you think Clarence Ross is? If you have never met him, invariably the answer will be, "Oh . . . six feet, maybe six foot two or so. He's very tall and impressive." Do you think so too? Then you're wrong. Clarence Ross is 5'8-9" tall! But, because of his exceptional development and his inherent bone structure, he seems much taller in photos. The big reason you might think this is because of his very long arms and legs. Take a look at his arms. The forearms are long and tapering, the arm is large in size but not chunky, on the contrary, the elbow gap is relatively large and this makes his arm seem even longer. So you want to know the how and why of building championship arms? The answer is triceps. TRICEPS! Those who have them are champions. Those who don't, never make the grade. The triceps is the potentially larger arm muscle . . . it is capable of being developed to the size of 15 to 20% bigger than the biceps. When fully developed, the triceps are larger than the biceps. This means that if we are to develop them properly, it can only be done by giving them more exercise than the biceps. 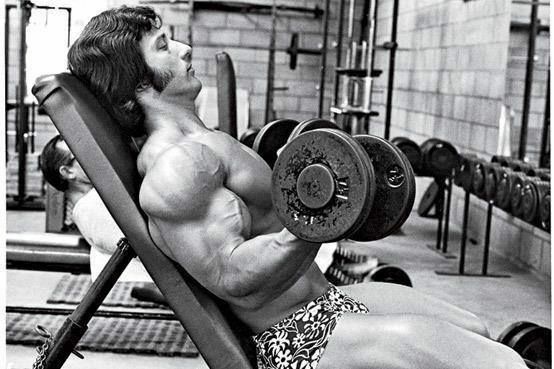 The recent advances in muscular arm size have been in part sparked by such training practices as super-sets, peak contraction, cheating routines and flushing, along with other methods that force maximum power and size into every bodypart. The bodybuilder owes it to himself to whip his shoulders into the absolute peak of size and powerful appearance. No other part of the body offers such opportunities for strength recognition. The stamp of every athlete, every man of exceptional power and unlimited endurance is a mighty, broad pair of shoulders. There are many ways to increase power. However, the one I prefer best, and the one that fits most readily in my regular training is the Squat. For Clarence this was a perfect outlook, for his heavy power training in the squat and his other power leg movements - leg presses, front squats and the like - gave him perfect development for his long structure. Instead of having a chunky thigh, heavily muscled about the knee, which would call attention to their length and dis-proportion, the power squats thickened and developed the thigh at the top especially, with a a graceful taper to the knee. For his structure this was perfect development. Calves have always been my major physical problem. Like most bodybuilders, in the early days of my training I performed one or two calf exercises, pumping up my calves completely. My calves responded very slowly, in fact the tape registered only minor increases. This of course was most discouraging and I subconsciously began to avoid calf training. I arrived at the conclusion that whatever I did for them was a waste of time. Therefore, out of habit more than anything else, I continued to perform a few calf exercises, not expecting much, if anything, from my efforts. Years after the rest of my physique had gained me some fame, I was ashamed of my calves and their weak, thin appearance. But, did I give my all to my calf training as I did with the rest of my body? The answer was NO! So I revised my program. I started to include more sets, a larger variety of exercises and worked up to a more concentrated training drive. I worked my calves three times daily, each training session until they were stiff and sore. And I began to get results. Gains were not amazing, it took weeks and weeks to gain 1/4 of an inch. But gains did come and the quarter inches added up to inches over time, until today. My 17.75 inch calves are about as big as I want them to be to balance the rest of my physique. 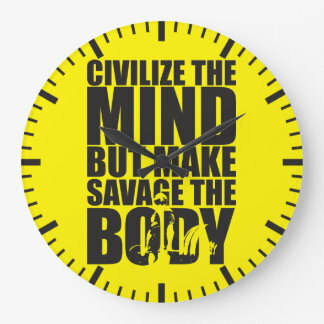 There are lots of reasons to have an eye on the clock when you're training. Timing your workouts and rest periods will make sure that you aren't taking too long between sets for what you want to accomplish; it will guarantee you finish your training with enough time to get to work; and it will even get you back on track when you're staring too long at the cute girl wearing yoga pants in the squat rack. But there is one aspect of timing in your workouts that you may be missing out on completely. One that will ensure that you are working your muscles in a way that optimizes growth. A method that has you time out the length of each phase (lowering, lifting, pausing) of each rep and, ultimately, each set in order to promote the greatest amount of muscle gain. This technique is simply called Time Under Tension (TUT) training. TUT can be achieved in two ways. The first is to set a timer - say, for 40 seconds - and continue to perform an exercise for that amount of time without stopping. A more effective way, and the one this program will focus on, is to use a tempo prescription for each rep. Why is this more effective? Because it allows you to specifically slow down the eccentric or lowering phase of each rep. And there is much research to back up that slow eccentric phases are an effective way to build mass. In our program charts, tempo is laid out as a four-digit number. Each number correlates with a specific phase of the movement and represents the number of seconds you will spend in this phase. -- The first number represents the lowering phase (for example, the descent in a squat, lowering yourself in a pullup, or bringing a bench press down to your chest). -- The second number refers to any pause at the bottom of the movement. -- The third is the lifting phase in which you are overcoming gravity to lift the bar or your body. -- The fourth number is any pause that might occur at the top. So a 4-1-1-0 tempo for a back squat would have you lowering for a 4-second count, pausing for 1 second at the bottom, taking 1 second to stand up, and then not pausing at the top. Using tempo this way will force each rep to last 6 seconds (4+1+1+0 + 6). If you maintain this tempo for eight reps, then the entire set will take 48 seconds, which falls right in the middle of the ideal time under tension range to build muscle (40 to 60 seconds). -- Most TUT programs (this one included) focus on a slow lowering phase and a fast lifting phase. So even if you lose count of the seconds for each, remember that you should go down slow and come up fast. -- You are going to want to cheat the rep speed and move faster as you fatigue. DON'T! Get a training partner to count the tempo for you if necessary. Three or four seconds is a long time. -- Be conservative with your weight selection. While you may be able to bench 100 kg for 10 reps normally, the longer lowering phase will make things much harder. Cut 20% off the weight you use. While this may not be great for your ego, controlling the TUT will ultimately give you the size you want. -- You will likely be very sore the first week or two of training this way. Prepare appropriately. -- Week 2: all reps go to 10-12. You will also need to choose your weights appropriately for each week. When the number of reps goes down, the weights should increase over the previous week's. When the number of reps goes up, the weights will have to decrease. Barbell Back Squat, 4 sets of 8 to 10 reps, TEMPO 4-0-1-0, 60 second rest between sets (for all). Some years ago when I was the editor in chief of Muscle Builder magazine, I interviewed Frank Zane many times. The articles he contributed to that publication were always of the highest quality in terms of both information and result-producing routines. Zane was probably the most scientific bodybuilder of his era. He kept detailed records of every workout and routine that he ever used. He was constantly analyzing every facet of his training, including his diet and sleeping habits. Zane's philosophy was that you don't have to have 20-inch arms and weigh 250 lbs to look impressive. He contended that most men become obsessed with obtaining huge size and making bodyweight gains. While he acknowledged that a certain amount of size and bodyweight are necessary, he believed that these are not the factors that determine a top physique. He rated muscle density, shape and symmetry and how those qualities are displayed as more important than who has the largest measurements or who weighs the most in competition. The person who looks the best is the one who wins the show. Here, in his own words, is the shoulder specialization program that helped make Frank Zane one of the most popular bodybuilders of all time. 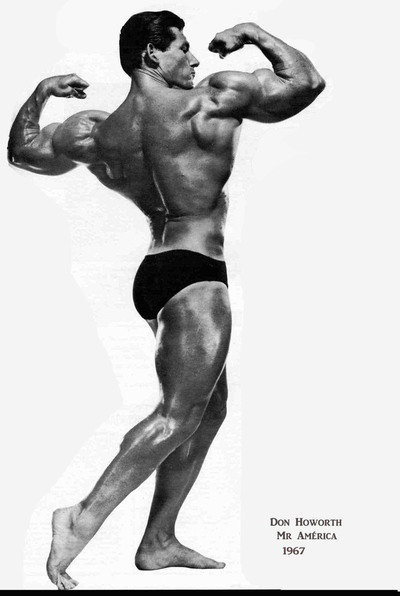 I've seen fantastic deltoids on fellows like Sergio Oliva and Larry Scott, but to me the all time champion of superior deltoid development was Don Howorth. I was awed by Don's width. Delts like that seemed preposterous, unreal -- except that they blended perfectly with his arms, chest and the sweep of his lats. It is my conviction that well-developed delts give any physique the stellar touch. After I lost the Mr. America contest, I made a solemn vow. At any cost I would develop deltoids like those of Howorth, who shouldered me out of first place. I knew what I had to do, and I've been blasting them hard ever since, turning my defeat by a deltoid into many victories. I really believe that. I like what my delts have given me. It took a lot of hard work and some fine-tuning of my workout program to reach my present degree of development and proportion. I realized that if I wanted delts like Howorth's, that total development of all the parts -- front, back and middle -- I needed to use more than simple motion. Abstract contraction of muscle doesn't do it. I've seen too much failure coming from thoughtless exercise. When I first started giving my delts priority, I was exerting tremendous effort. Each rep, each set seemed like a foreign entity, something that is tolerated for a necessary exchange. Gradually I began to feel that I was becoming one with the weight, uniting myself with it on each movement. In my opinion this is the trouble with the average bodybuilder's workout. He thinks of himself as being separate from the weights and must therefore exert a tremendous amount of effort to move a weight that he perceives as something outside of himself. That idea doesn't work for me. Here's a tip that has paid off for me. I've learned the anatomy of each muscle, including its origins and insertions and how it functions. During workouts I close my mind to all else except the muscle I'm working. I envision it contracting and becoming pumped and growing larger with each rep. I try to think positively right through my training session, practically willing the muscles to grow. I proved to myself that if my concentration was keen enough, I could close the breach between myself and the exercise apparatus. I riveted my attention on using proper form to the extent that no external environment existed for me. I became a part of the workout. Distractions were filtered out. You have to get into this process and work at it to experience what I mean. It transcends simple training. You feel like a baseball player who has just made the perfect swing and connected for a home run. Cable Upright Rows, 50 x 15. Cable Upright Rows, 55 x 12. Cable Upright Rows, 60 x 9. Cable Upright Rows, 65 x 9. Cable Upright Rows, 70 x 8. I rested about two minutes between tri-sets. Gradually I reached the point where my endurance and willpower permitted me to go through all five cycles without resting at all. Those 15 nonstop sets, performed one right after another, became a real adventure in training. The pump is intense, and the muscles burn. You start to rise above the pain, and that's when you approach UNITY, the junction of yourself and the apparatus. Then, to complete the program, I set the weight on the pulley machine at 20 lbs and performed five sets of one-arm pulley lateral raises for each arm without resting at all. After I completed the full program, which totaled 25 sets, my delts were so pumped that I could barely raise my arms. The result was a remarkable increase in delt size, shape and definition in a relatively short period of time. Cable Upright Rows, 5 x 15, 12, 9, 9, 8. Incline Bench Lateral Raises, 5 x 15, 14, 13, 12, 10. One-Arm Pulley Laterals, 5 x 10-15. This is a very tough program that's much too severe for anything except pre-contest training/peaking. Don't try to jump into it immediately. Instead, I suggest the following plan for a starter. Use this program two or three times a week, depending on your training needs and schedule. You can intensify it by performing it in superset fashion, as follows. Remember that supersetting involves performing two different exercises, alternating them without pausing to promote a greater pump stimulate muscle growth in a specific area. One superset equals one set of each of the two exercises. Incline Bench Lateral Raises, x 4-5. Adding in several weeks of high-rep workouts into your training progression after you've completed a cycle of heavy lifting can leave you feeling looser and more recovered. It gives your joints a break and also allows your ligaments to heal and become more elastic. Working in occasional high-rep cycles wil also improve your muscle recovery. The older trainer will find higher reps more forgiving, and combining them with in supersets can develop better conditioning, as well as a stronger desire to continue training. The occasional high-rep split will prime the muscles to be more productive when you go back to your relatively lower-rep workouts. One way that it does this is by increasing the mitochondria, which are the energy source for most cells. Higher reps will also bring more red blood cells to your muscles, which will in turn deliver more oxygen. When you get back to your heavy workouts, you'll be refreshed and ready to go. When training with high-rep supersets, make sure that, once acclimatized, you don't use weights that have you just going through the motions. For each set, try to find a weight that will have you close to or hitting failure at the prescribed number of reps.
Alternate back and forth between the two days for six days per week, which will have you hitting each muscle group three times a week. You're going to want to start with the larger groups (i.e. back and quads) and work your way down to he smaller groups. For each muscle group, pick two exercises that you will superset back and forth, trying to take no more than 15 seconds of rest between sets. With each superset you are going to progressively decrease the number of reps by 10, in drop-set fashion, and (hopefully) increase the weight used. We want to use a weight that allows us to hold great form while failing at the desired number of reps. If you hit failure before the desired number of reps, you can set the weight sown and take five deep breaths, then continue from where you left off until you get all of the reps. Even if you have to take a break more than once, that's okay as long as you finish the set after your short, five-breath breaks. The reps for these supersets will go 40, 30, 20, 10. So, you will do 40 reps of exercise one, 15-second rest, 40 reps of exercise two, 15-second rest, 30 reps of exercise one, 15-second rest, 30 reps of exercise two, 15-second rest, and so on until you've completed all the sets and reps. By the end of the last set your target muscles should be at maximum fatigue. It not, you are lacking in intensity. Next time, up your effort level. The examples shown below utilize same-bodypart supersets. You can also quite easily set up antagonist supersets in your high-rep superset training programs. The split would then be different. An example of the latter will also be shown. Supinated Bentover Rows - 40, 30, 20 10. Lateral Raise - 40, 30, 20, 10. Dumbbell Curl - 40, 30, 20, 10. Barbell Wrist Curl - 40, 30, 20, 10. Lat Pulldown - 40, 30, 20, 10. Pressdown - 40, 30, 20, 10. You can also compose Tri-Sets here. What ever happened to Ralph Kroger? I'm sure this is a question many readers have asked when Ralph disappeared from the national scene. For those readers new to Iron Man, Ralph made a meteoric rise to physique stardom in 1966 when he first annexed the Mr. California, including all the bodyparts except abdominals, and taking the Best Legs award in the Mr. America contest, beating out such giants as Oliva, Gajda, Tinnerino and Haislop. Ralph also took third place in the Mr. America competition in one of the most hotly contested events of the past decade. The following two years Ralph limited himself to only national competition in physique, taking 4th in the 1967 Mr. America competition and 3rd in the 1968 Mr. U.S.A. crown as well as the Best Chest subdivision. For the past two years Ralph has stayed away from national competition due to business pressures and has limited himself to local power and Olympic lifting competition, with 1600 and 1035 totals respectively as a 242 pounder. However, Ralph has had a long range plan in mind with the ultimate goal of winning the Mr. America contest. Ralph's previous philosophy in physique competition has been to enter the contest and do as well as he can and be content with the results. Lately he has reevaluated his thinking and feels he is going to train with the intention of winning, feeling that, after all, his competitors are only human too, and that if he never misses a workout and his workouts are an intensified effort, he will end up winning the title. Considering he almost upset the unbelievable Sergio Oliva for 2nd place in 1966 with his previous happy-go-lucky attitude, with his new philosophy his competitors had better watch out. For the past two years Ralph has trained without missing a workout and he feels that 1971 could be his year. He is currently in the process of bulking up which he will continue to do until two months prior to the Mr. America competition, when he will alter his diet for the maximum in muscularity. Since the thesis of this article is bulking up, the remainder of it will be devoted to Ralph's philosophy and methods of obtaining "muscular" bulk. Ralph feels that to gain an excessive amount of weight that isn't primarily a muscular gain is largely a waste of time and faulty thinking. By no stretch of the imagination can Ralph be termed a hard gainer as far as bodyweight. He has gone from 205 to 235 lbs in one month's time when previously gaining weight. Even at this weight he carries a trim waistline and a great deal of muscularity. He feels that diet is the prime factor in gaining weight or achieving muscularity. However, as mentioned before, he doesn't let his waistline get out of control when gaining and works it hard on a daily basis which he recommends to every trainee who is in the process of bulking up. Ralph feels that the average weight trainee would make faster gains if he paid closer attention to his diet. In his quest for greater size he avoids fried foods, but copious amounts of his food broiled, and eats a great deal of meat, fish, eggs, cottage cheese, fresh fruits and vegetables. Rather than eat a great deal at each meal and stretch his stomach, he is constantly eating during the day. A great asset to Ralph in bulking up has been drinking raw milk in large quantities during the day, which he mixes with a commercial protein powder. Raw milk can be obtained in any health food store [ah, the '70s]. Note that very little has been said so far about his actual training when seeking bulk. Ralph feels that the training, if it is intense and the trainee has confidence in his method of training, will produce muscular gains regardless of the amount of sets, reps, or weight. Ralph is currently training every body part, every day, seven days a week while he is bulking up. Now I realize this statement is in contrast to what most people feel is the most ideal way to train for bulking up, but it is working for Ralph. He feels that this is a beneficial way for anyone to train, and anyone in good condition could make gains from it. By doing fewer sets per body part, but more frequently, the trainee will stay enthusiastic and put more into each exercise, and also work the more neglected body parts more effectively. As an example, how many trainees would do 15 sets of leg curls in a workout or a total of 30-45 sets of neck work in a week? Ralph does 6 sets of leg curls a day, which totals 42 sets a week. Bulking up is, of course, a favorite topic of lifters because it is, after all, what most of them are after. This can really pose a problem for some fellows. Now, Ralph, as mentioned, is definitely not what would be considered a hard gainer in this respect, as few of the top men are. Other men, however, find it almost impossible to gain anything at all, no matter what system they use. Every man has a different metabolism, different energy level and different ability to recuperate. Some men can only bulk up on two-day-a-week training programs, while others can gain bulk very rapidly, adding many pounds of muscle quickly. Now, because all men are different, each one having his individual pluses and minuses, it should be understood that what works for one man may not work for another. Likewise, if you are a powerlifter you will not have the same ambitions in bodybuilding or bulk building, for the powerlifter may care little for how he looks, but wants the most muscle bulk even if it might also include some fat. Many advanced men make no changes in their training programs when bulking up but only change their diets, and can gain as much as 20 to 30 lbs in one month without adding much fat. To trim down they again stay on the same program, but again make a change in their diet. Many men, even advanced me, might find the every day training Ralph uses would exhaust them in two weeks. Study your own body and its responses to exercise and diet, and adapt programs to your individual needs. 1) What's the key to achieving rapid abdominal development? -- The answer to achieving that much desired washboard appearance lies in the study of the anatomy of spinal movement. The spine is made up of 33 vertebrae, only 24 of which form the flexible portion located above the sacrum. There are seven cervical vertebrae, 12 thoracic vertebrae and five lumbar vertebrae. With the exception of the first two cervical vertebrae, the extent of movement at any vertebral joint is slight, particularly in the thoracic spine, although the total movement of all joints is quite large. Within these anatomical constraints, performing crunches for abdominal development involves flexion at all of the thoracic and lumbar vertebrae. 2) Do you believe the crunch is the best abdominal exercise? -- The crunch is good, but so are a number of other exercises. There are many variations of abdominal exercises, and there are just as many abdominal devices. All of the good ones, however, have one thing in common: In one way or another bring the ribs (the origin of the rectus abdominus), and pelvis (the insertion), closer together through spinal flexion and abdominal-muscle contraction. Your internal and external obliques aid in this movement as well. 3) What other ab exercises are good? -- Other than the crunch, you can do reverse crunches. This exercise has the same effect as crunches; however, your knees come toward your face instead of vice versa. Some bodybuilders believe that they can get better lower-ab development with this exercise, but I personally doubt it. The research tends to refute this age-old myth. Ever see a guy with great washboard upper abs but a saggy lower abdomen? Or vice versa? There's no such thing. The abdominal wall benefits equally from crunches and reverse crunches. 4) What about hanging leg raises? -- Again, the myth is that hanging while raising your knees upward is going to selectively develop your lower abs. Actually, the hanging leg raise is the ultimate version -- the high stress version -- of reverse crunches. It's a very difficult movement to master, however, so your best bet is to do reverse crunches. 5) So you recommend crunches, reverse crunches and - for those who are strong enough and can do them correctly - hanging leg raises? -- Yes, those are all good abdominal exercises, but the best way to train the abdominals is to first pre-stretch the muscle, then contract it against resistance. Which is exactly what the Ab Bench crunch does. This exercise allows you to stretch the rectus abdominus prior to contracting into a crunch position. Full range movements like this are generally more productive in improving strength, tone and mass. It has to do with the amount of work being accomplished on every set. Here's what happens at the cellular level. When you stretch a muscle to its full length, the myofibrillar elements, actin and myosin, are fully stretched. That means the overlap between the actin and myosin myofibrils in minimal, and you're not capable of producing force. The cross-bridging going on between the actin and myosin strands is what causes contraction. Over a few weeks' time the actin and myosin myofibrils adapt to this new requirement of having to produce force while being stretched. They do so by growing longer in an attempt to increase the amount of overlap between them. This, of course, has the net effect of increasing the amount of force you can generate even while stretched. 6) Isn't this arching back into the stretch position dangerous? -- Not a all. The curvature of the Ab Bench's back pad is precisely matched to the range of movement Mother Nature intended for your thoracic and lumbar spine. This ensures non-traumatic movement from an unforced hyperextended position to an unforced hyperflexed position. What's more, full-range crunches are 100% more productive than conventional on-the-floor half-range crunches because the amount of work you're accomplishing is virtually double. 7) And you believe it works the entire rectus abdominus, from rib cage to pelvis? -- Absolutely. While electromyographic studies have demonstrated that the upper portion of the abs produces more activity when you perform crunches with no weight, when you add as little as 10 pounds the activity is equal throughout the muscle. The same studies demonstrated that reverse crunches can produce greater activity in the lower abs than in the upper abs, but they also produced activity in the obliques. 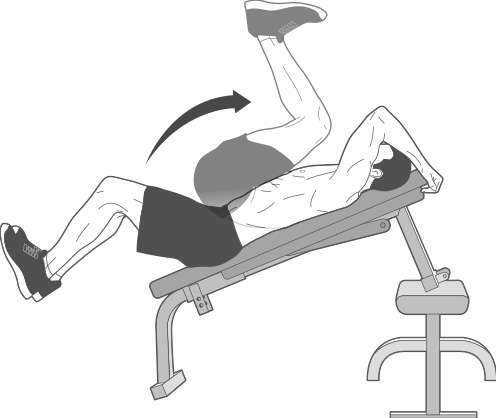 The bottom line is that when resistance is applied to the crunch movement, as it is with the Ab Bench, differences in electrical activity disappear and contraction becomes relatively uniform throughout the entire rectus abdominus. 8) Do you favor high repetitions for ab training? -- Like all other muscles in your body the rectus abdominus responds best to progressive resistance. You must train your abs as you do the rest of your muscles, but don't think that adding weight is going to give you a heavy waistline. The abdominal wall is a sheet of muscle, unlike, say, your biceps. Your rectus abdominus isn't prone to bulge like a biceps. People with large waistlines tend to have either a large pelvic girdle, a beer belly, lots of fat or a combination of the three. 9) So if the rectus abdominus is a sheetlike muscle, the segments we see aren't individual muscles? -- Correct. I read somewhere that each segment moves or rotates a small part of the spinal column about a point known as a pivot point. According to this source, there are four pivot points, relating to the visible segments, along the spine, and as the ab muscles contract, the pivot point moves down. This is definitely wrong! While the lumbar vertebrae have a greater range of motion than the thoracic, it's a function of the anatomical structure of the spine and not the result of a small portion of the abs contracting. In fact, each of the movable vertebrae in the thoracic and lumbar spine is a pivot point, and there are many more than four. 10) So the best way to train abs is . . .
-- If you don't have an Ab Bench, use crunches and reverse crunches -- and try to get your hands on an Ab Bench as soon as you can. It's simply the best device for abdominal training on the market today. Maybe it's just me, but I've long had the impression that the 1936 Olympic Games provided an epochal moment in the sport of American weightlifting. Perhaps it's because a number of the faces on that year's Olympic lifting team enjoyed an amazing amount of protracted notoriety in the Iron Game, as well as the fact that they participated in the "Hitler Olympics!" In reality, though, it is just me, as the sport of Olympic weightlifting here in America began coming of age at the prior Games in Los Angeles in 1932. "The essential thing is not conquering but fighting well." Before getting into specifics about the actual lifting competition which was staged at the venerate Olympic Auditorium, a few facts in general about the '32 Olympics are worth noting: Very probably due to the worldwide economic depression which was engulfing the global economy of the day, as well as the fact that humanity as a whole was not that far removed from the ravages of World War I, the city of Los Angeles was the only bidder for the rights to hold the 1932 Games. In fact, many "knowledgeable" international sports insiders were pretty open about the fact that in their collective opinion the organizers must have gone mad to even bid on it as they would surely "lose their shirts." And while prevailing conditions did cut the number of competing athletes by half as compared to the 1928 Games, contemporary newspaper accounts contend that the Los Angeles organizers easily reached "profitability", with some seemingly overly charitable reports claiming that they netted upwards of a million dollars! As to the actual lifting competition itself, 28 athletes from eight nations vied for medals on July 30th and 31st of 1932, with France and Germany tying with three overall medals apiece. Note should be taken that the three won by France were all gold. Likewise, American lifting got a fine "shot in the arm" by virtue of the fact that Henry Duey and Tony Terlazzo came away with bronze medals. Against the gloomy backdrop of encroaching joblessness and the ever-widening dark business climate, the Los Angeles Olympics, along with its promise of showcasing the best athletes on the planet, provided a much needed distraction for many. Which explains why established lifting luminaries like David Willoughby and lifting luminaries in-waiting like Bob Hoffman were on the scene. Frankly, Los Angeles was very possibly the most fitting place in America to hold an international competitive lifting event at the time. Why? The state of California in general, and L.A. in particular, were the hottest hotbeds of national competitive lifting when the Olympics blew into town. 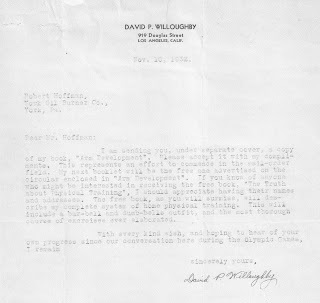 This situation, in no small part, was attributable to the Herculean organizational efforts of Willoughby, who was one of the power trio (George Jowett and Ottley Coulter were the others) who oversaw the American Continental Weightlifting Association (ACWLA), which was the sanctioning structure of competitive Olympic lifting activities here in the USA in the 1920s. According to history, the ACWLA was formed to establish a uniform set of criteria by which the strength accomplishments of lifters could be accurately compared and rated equitably. Understand that prior to this organization's inception, America and the sporting press, such as it was, were treated to legions of performing professional strongmen professing to be "The Strongest Man in the World." Hence, true topflight, verifiable strength and power, and especially that of amateurs, was completely overlooked in favor of wild claims of questionable veracity and crass commercialism. Enter the ACWLA which was very much patterned after the guiding policies of the British Amateur Weightlifting Association (BAWLA), which, by the way, was affiliated with the International Olympic Committee (IOC) or its counterpart of that era. Suffice it to say that there are very interesting accounts available on the 'net which detail the byplay between Coulter, Jowett and Willoughby (especially in terms of striking a workable balance between the degrees of pure athletic idealism, desirable amount of tolerable commercialism and other objectives among them), as well as the ups and downs they encountered with established physical culture publishers like Alan Calvert, Bernard Bernard and Bernarr Macfadden in getting the ACWLA viable. By the way, in reading some of these exceptionally detailed accounts, one gets a clear perception, warts and all, as to the state of American competitive lifting, as well as the existing mail order muscle and the physical culture magazine publishing businesses, when Bob Hoffman stepped into the field. Considerable insight about Bob and his "style" can be gleaned from these papers. Getting back on track, in 1932 the presence of the Olympic Games here in America had to be viewed as a once-in-a-lifetime, must-see, sports spectacular of ultimate proportions. So, if you were an eligible competitor or coach, invited official, VIP type, enthused spectator, what have you, you were getting to L.A. by any means possible. In brief, that meant at your own expense for back in those days the governing committees of various sports were nowhere near as well-heeled as they are now, and could not afford to outfit and cover the expenses of their own athletes. Undeniably, there was personal sacrifice involved for most. In the case of Bob Hoffman and some of the competing lifters, this meant a 3,000 mile cross-country car ride . . . and back home again. Comprehend this, the vehicular excursion precluded a lot of valuable last minute preparatory training, irregular meals and irregular sleeping accommodations, along with a lot of general discomfort from riding in a car hours on end. Plus, and this I had impressed upon me by one old time York Barbell lifter, a cross country car trip back in the 1930s was more iffy due to the fact that the typical car, and especially the tires, were nowhere near as reliable as today. I was told that Bob and his traveling companions encountered disruptions with tires and engine breakdowns on both the trip to and from L.A.
Obviously, each man's correspondence offers terrific insights to his short term future plans in the mail order muscle business, or in Bob's case, the magazine/barbell manufacturing field. 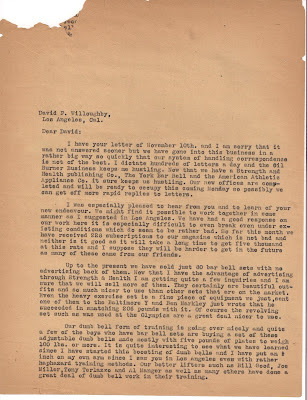 One thing regarding Willoughby's announcement that he was on the verge of venturing into the commercial side of muscles drew my attention: It involved a comment Jowett made about Dave I encountered while researching the ACWLA. 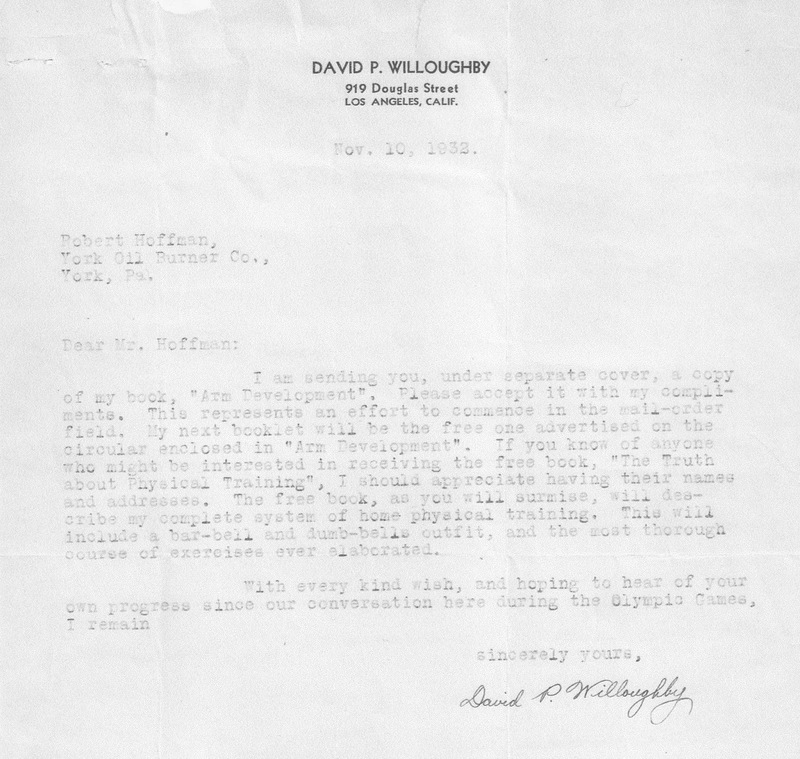 The former wrote to Coulter at one point complaining that Willoughby was too focused on the pursuit of idealistic adherence to rules and structure, and did not give enough consideration to the money-making side of the lifting experience. Perhaps Jowett won Willoughby over to the monetary side after all. Come to think of it, if I have my dates straight in my head, Bob and George Jowett had established a working relationship prior to the Los Angeles Olympics. It is, therefore, conceivable that GFJ set up/initiated this meeting between Bob and David. 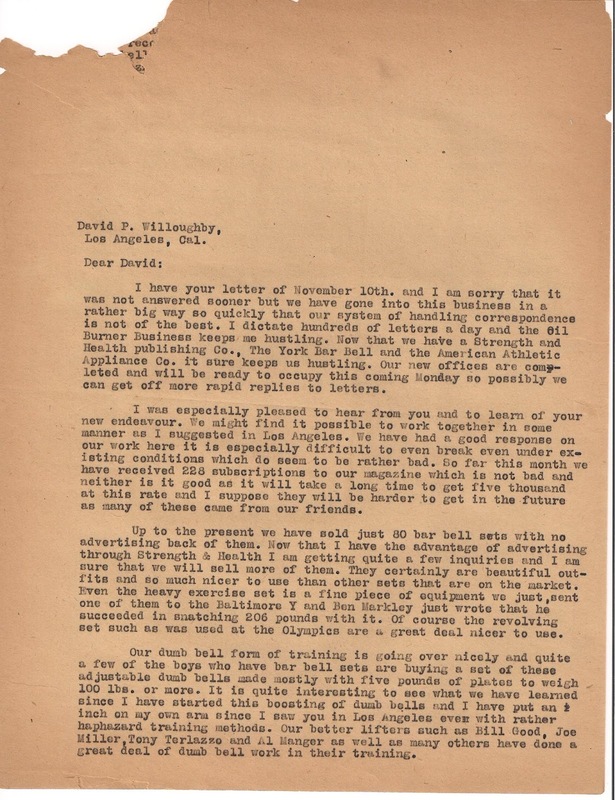 At the same time, Bob's reply denotes that a lot was going on in early 1933 with him and his transition from the oil burner field to the muscle business. Insights like he launched with a trio of companies - Strength and Health Publishing, York Barbell manufacturing per se and American Athletic Appliance (which I think was Jowett's suggestion to Bob), new offices were on the way, shortfall on his monthly subscription expectations, how many training sets (not Olympic) his concern had produced up to that point, and his experiences with dumbbell work. Read and enjoy their correspondence and decide if your prior perception of each individual has changed at all.